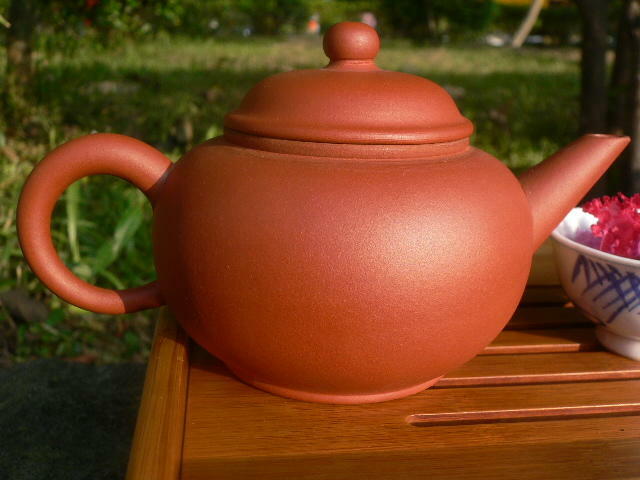 This yixing teapot is already 7 years old and made with grinded zi sha stone. This kind of good material is progressively being used up in Yixing as its factories manufacture millions of teapots every year. So, in case of yixing teapots, it makes more sense to buy old rather than new. Teaparker even suggests to buy those made early this century, but they are not easy to find and not very cheap either. This particular one was made by Xi Mei Hua. Under the lid, you can read his first name, Mei Hua. It is rather a large pot in my collection: 170 ml. And it weighs 200 gr. As I wrote yesterday, I dedicated this teapot to old pu er. 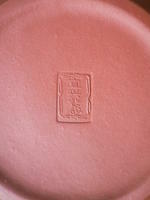 I could also have used a zhu ni hu pot. But the characteristics of this zi sha pot are somehow similar to the zhu ni hu, as its walls are quite thick. The teapot came in this solid wooden box. A small red tea towel was placed above the teapot to protect it well against shocks. I am quite confident that with its thick walls and solid box it can travel the world in a parcel. One can also test the quality of the teapot by carefully touching its rim with the lid. My teapot will give a high pitched sound, sign it was baked at high temperature. Bad quality pots are baked at lower temperatures and sound a low pitch. The baking temperature will have an effect on how well the teapot is able to handle the boiling water. This is the kind of test that shop owners don't like. It's like playing with something fragile that doesn't belong to you. Only do this if you are really serious about purchasing the teapot. Very beautiful tea pot. I have two yixing teapots myself and use them both. The loose leaf green tea taste so much better! Thanks, Joy. It is indeed possible to make some green teas in an yixing teapot. The lingering after taste is sometimes improved. But most of the time, green tea will be best made in a glazed gaibei/gaiwan. It preserves more its freshness and clarity. Thank you for the hint about glazed-ware. 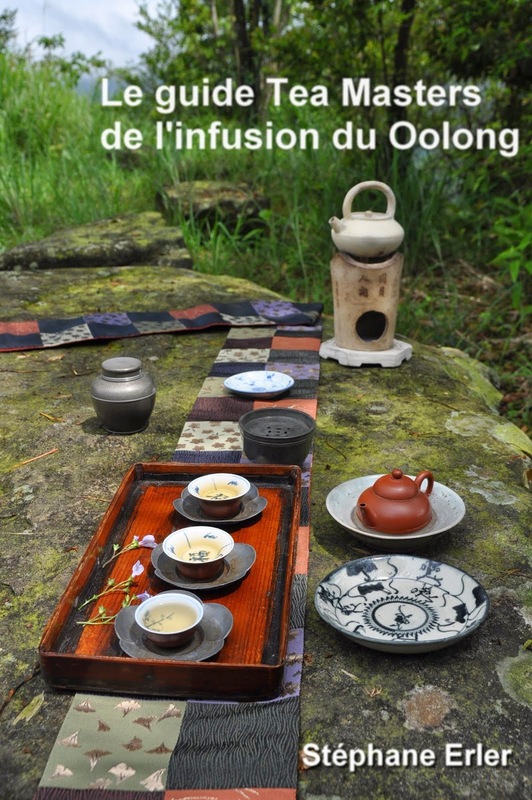 What tea would you suggest best for yixing teapots and do you have a preferred brewing technique? Besides green teas and jasmine/flower teas, I'd say all other Chinese teas benefit from an yixing teapot (oolong, pu er, baozhong, tie guan yin...) However, you must dedicate one yixing teapot per tea kind. And the brewing method is gongfu cha. (Same as what I described recently for brewing in a gaibei/gaiwan). Stephane, is this teapot a sister of the 2 ones you sent to me with pu ers in my first order to Tea masters ? * and also I can check 'live' the right pitch you're talking about for proper baking of the pot ! * I have now seasoned my new teapot following your advice (alternate cold water and hot water and check the odor of the clay fading away); first tasting tea and tapot was a sample of yours, a yi wu pu er tuo cha from 1985. well, this teapot will be dedicated to old pu er ! when you say the teapot is already 7 years old, do you mean that the potter made it 7 years ago with still remaining proper clay (out of zi sha stone) ? I confirm both questions. 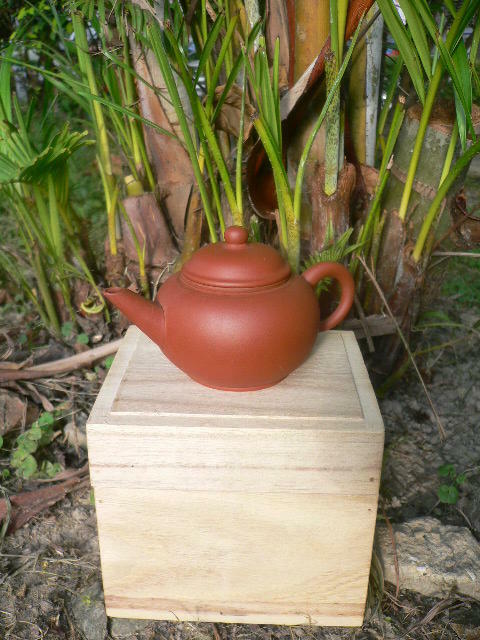 This is a sister of your 2 teapots and it has been made 7 years ago with good clay. I also confirm that tis teapot travels well, and fast! Mine is dedicated to my roasted Tie Guan Yin. First, it is not of the greatest workmanship ever : the lid is not completely tight, and the spout is not completely in line with the handle. 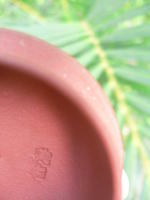 But it is not in bad shape though, and the clay is of good average quality. As Stephane said, it keeps the charcoal taste of the roasted teas inside the teapot, but it also kept, for the first brews, a bit of the taste of the tea. 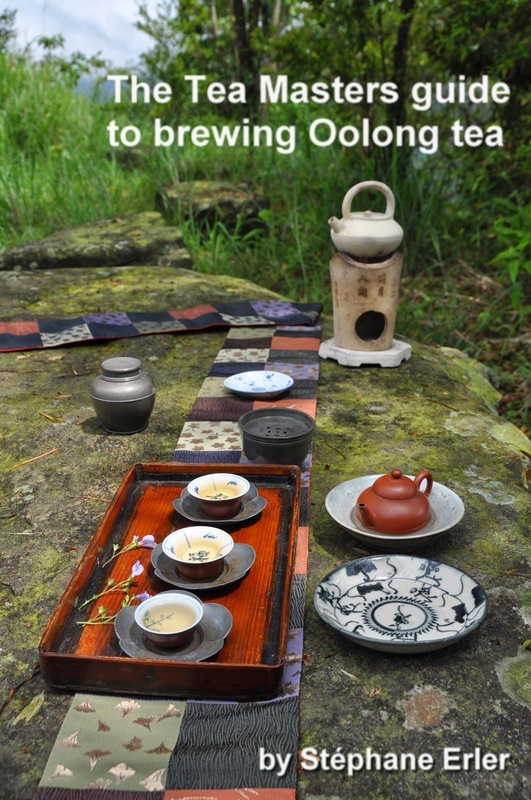 The first brews were a bit 'duller' than with a Gaiwan, but after some time, the quality of the liquor improved, and now it is really better than with a gaibei. It makes me think that, besides rinsing it as Stephane told us, it may be usefull to manually season the teapot, at the beginning, by brewing the same tea leaves 4 times 2 hours (let them brew for 2 hours, then pour the water out and put back boiling water), which is what advise Mrs Tseng from the Maison des 3 thes, in Paris. And maybe do that two or three times. I'm using the round Duan Ni teapot for roasted TGY. I believe your teapot also works well for TGY thanks to its thick walls and soft clay. You are right that, in the beginning, the clay will also make the aromas a little bit duller (while improving on the yun, the aftertaste). I've had a similar experience with my Duan Ni. Actually, high grade roasted TGY has such a beautiful nose that it doesn't need much improvement (using a teapot). I find the teapot is much more useful for lower grade roasted TGY, which don't have such strong aromas. And a little trick: since it comes without built-in filter, you can use a wooden toothpick inside the spout to keep the leaves from blocking the water flow.